The general circulation of the Indian Ocean is the least understood of all of the open ocean basins. This is due to the fact that the Indian Ocean surface and deep currents are more complex and variable compared to the other ocean basins. The monsoon winds drive the seasonally reversing surface currents of the northern part of the Indian Ocean. The southern part of the basin, south of 10°S to the Subtropical Convergence, is centered on the zone of subtropical high atmospheric pressure, which forms a continuous belt around the globe during the Southern Hemisphere winter. 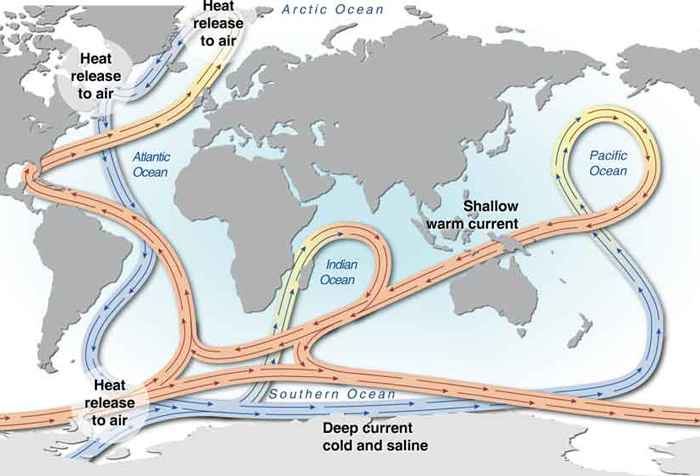 The global thermohaline circulation includes the transport of warm, relatively fresh upper-ocean waters from the Pacific through the Indonesian Seas to the Indian Ocean. Climatic phenomena such as the East Asian monsoon, the Indian Ocean Dipole (IOD) and the El Niño-Southern Oscillation (ENSO) exert a strong influence on the transport, water properties and vertical stratification of the Indonesian Throughflow (ITF). How has the atmospheric and ocean circulation of the Indian Ocean changed in the past and how will it change in the future? How do these changes relate to topography and connectivity with the Pacific, Atlantic and Southern oceans? What impact does this have on biological productivity, carbon cycling and fisheries? CO-CHAIR France Institut de Recherche pour le Developpement (IRD), Paris. CO-CHAIR USA University of Massachusetts Dartmouth. Dr. Helen Elizabeth Phillips Australia Institute for Marine and Antarctic Studies (IMAS), University of Tasmania. Prof. Yue Fang China First Institute of Oceanography, State Oceanic Administration, Qingdao, China. Dr. Tarek Mohamed Ahmed El-Geziry Egypt National Institute of Oceanography & Fisheries (NIOF), Alexandria, Egypt. Dr. B. Praveen Kumar India INCOIS, Hyderabad, India. Dr. Iskhaq Iskandar Indonesia University of Sriwijaya, Sumatra Selatan, Indonesia. Mr. Balla P. Magero Kenya Kenya Meteorological Department, Kenya. Dr. Emily Shroyer USA Oregon State University, USA.